The last time that I came across Frédéric Chopin in a game was Eternal Sonata, in which he explored a dreamworld of his own creation in the hours before he succumbed to tuberculosis and passed away. Now the Polish composer has been brought back from the afterlife in Frederic: Resurrection of Music, a game that doesn’t wait long before it descends into a nonsensical stupor. Understandably confused to be met with the bustling, neon-lit streets in Paris when he exits his tomb, Chopin collects his thoughts on a nearby bench when his muses – Nete, Hypatie, and Mesi – soon appear. Sensing his return, they present him with pocket-sized artefacts of great power: a carriage that will take him to anywhere on Earth, and his grand piano that they kept for safekeeping. After saying their goodbyes to appear in a Greek salad advert for a famous and influential fast food chain, Chopin is soon confronted by Jean, who proclaims that he is the greatest musician in the world. 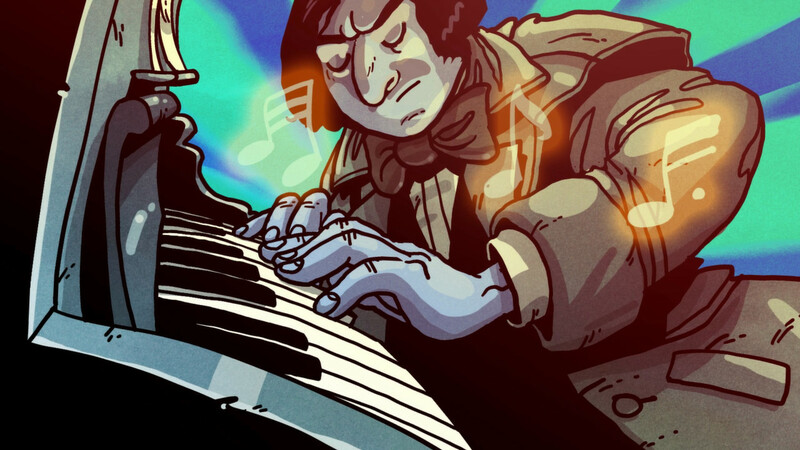 These are the bafflingly quirky events that set Frederic: Resurrection of Music in motion, an adventure in which Chopin must battle his opponents in musical duels to save the world of music from the brink of destruction. You soon learn after your first duel that it was an unknown masked figure that brought you back to life, and, wanting to know the reason why, you fly to the United States in your search for answers. That inspirited quest is repeatedly interrupted by musical duels, in which Chopin is confronted by musicians that each have an affinity for a particular genre. Whether that be electronic, reggae, country, or R&B, Chopin finds that he must prove that his musicality outshines that of his rivals. That is an idea that leaves developer Forever Entertainment with enough room to take a handful of the composer’s classical pieces and remix them in modern genres, and it these that you will perform. As a music rhythm game, Frederic: Resurrection of Music doesn’t stray too far what you would expect. Guitars are out and Chopin’s grand piano is in, the player looking out for notes as they cascade down the screen and pressing one of seven keys before they pass by. Correctly striking ten notes in a row will increase the multiplier value, and you may have the chance to perform a super attack – your ultimate goal being to perform better than your opponent, which is represented in the power indicator at the top of the screen. Your timing is important and the perfect moment to press is when the not is exactly in the middle of the key, which requires some guesswork leading to some imprecision that soon impacts your score. Colours around the musical notes attempt to lend some guidance, with green earning you the least points, blue slightly more, and red being the perfect moment to strike the key. If a musical note has an arrow you have to hold it down until its tail disappears, but the real kicker is that the ‘perfect moment’ to hit a note is actually a second or so after the music that accompanies each duel. This soon becomes a constant bugbear, even if it was something that I managed to adapt to somehow. Frederic: Resurrection of Music has four difficulty options in Easy, Normal, Hard, and Chopin, which, aside from the Arena content, is the only way that you will elongate your time with what is ultimately a short experience. The harder difficulties aren’t much more challenging, and there’s not much reason to consider tackling them aside from getting your money’s worth. However crazy they are, it’s at least worth taking a moment to mention that the hand-drawn, animated comic sequences that are interspersed with each musical duel are fantastic. By comparison, the voice acting is underwhelming and, more than anything, uninspired, failing to play on the game’s comic undertones. Chopin’s remixed compositions are certainly unique, but there is a missed opportunity to let players hear the original piece compared to how it has been transformed. Your road to becoming a master of the piano in Frederic: Resurrection of Music is entertaining, but one that is riddled with shortcomings. While you may rally against the soulless music labels and mass-produced popstars that have hindered all creativity, more conviction is needed to deliver a more rousing performance. That, and more content is needed, because Chopin bows out long before the curtain call.